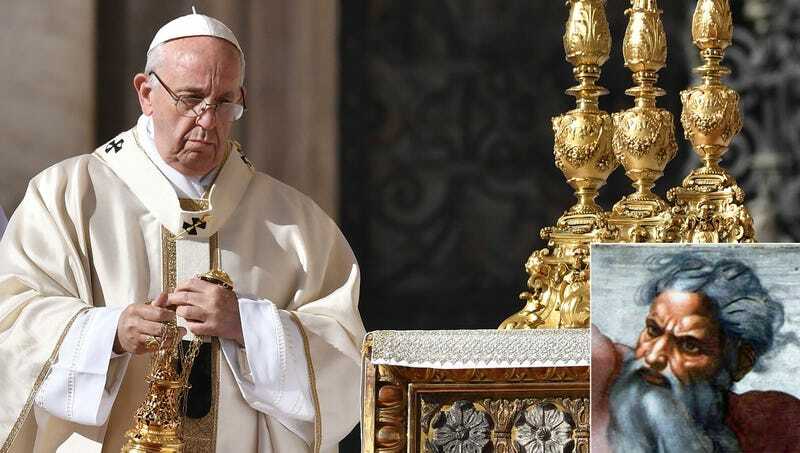 VATICAN CITY—Announcing that the all-powerful deity had met the requirements for being considered a blessed person within the Catholic Church, Pope Francis beatified God on Monday, initiating an important step in the Almighty’s journey to sainthood. “Our independent committee of researchers has verified that the Lord’s intercession was directly responsible for the creation of existence, thus allowing Him to proceed further in the canonization process,” said the pontiff, explaining that the Almighty had already earned his previous status as a venerable servant of the Holy Spirit through his heroic deeds, embodiment of the Church’s teachings, and promotion of the faith, and that he was confident they would be able to confirm his performing of a second miracle in order to fully make him a recognized saint. “Our team of theologians has thoroughly analyzed relics, documents, and testimonies from God’s life, confirming that He performed an act unexplainable by reason or science. While the canonization process is technically supposed to occur five years after a candidate’s death, God has been granted a special dispensation given the fact He is one of the most venerated figures within the church.” At press time, a cardinal in Romania, acting as Devil’s Advocate, disputed the beatification, arguing that God had committed many violent acts in the past He had not repented for.